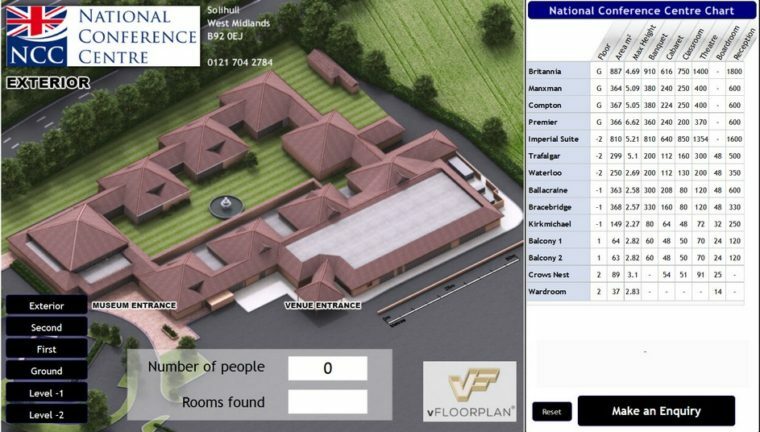 Solihull’s award-winning National Conference Centre (NCC) is now reaping the rewards of its investment in a state-of-the-art, mobile-responsive interactive HTML5 vFloorplan. The NCC welcomes more than 200,000 guests every year to its 13 suites used as meeting, conference and exhibition spaces. 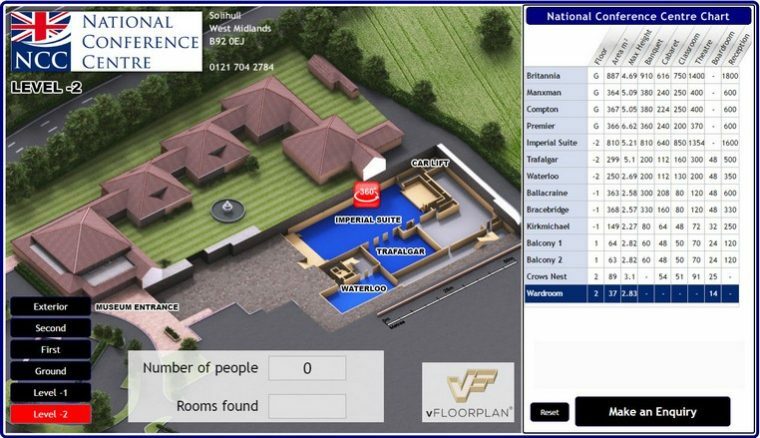 An early version of vFloorplan was first supplied to the National Motorcycle Museum (NMM) in 2013. 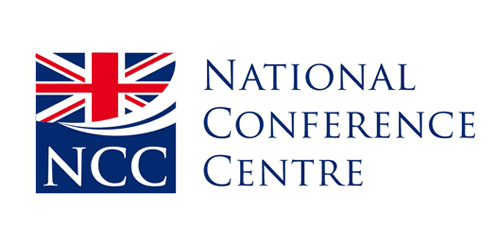 As demand soared for its meeting and conference spaces, the venue side of the business developed into its own brand, The National Conference Centre (NCC), which now incorporates NMM. 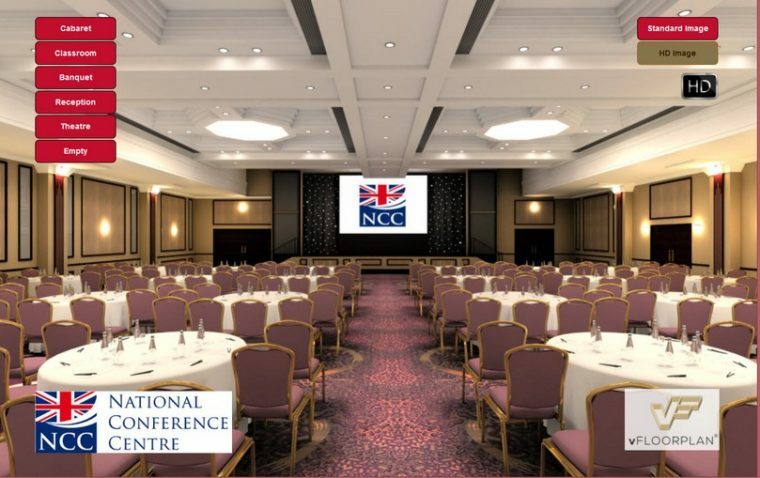 Its success as a venue allowed the NCC to increase its space and, before long, it became established as a major venue convenient from all parts of the UK. The increased investment and roll out of the hugely upgraded and latest vFloorplan v3 will ensure visitors see the venue’s capacity and versatility when they visit the rebranded NCC website. This now includes a vFloorplan, showing all available spaces to enable visitors to search for the perfect space to match their delegate numbers and type of event, as well as to consider other nearby rooms for a reception or for breakout spaces. As vFloorplan also generates qualified leads that include all of these choices made, the NCC team have a greater opportunity to win new business. The NCC joins QEII Conference Centre who also has a new version 3 – check out our post on QEII. Hosted by vFloorplan and running on the NCC’s website, the fully interactive vFloorplan showcases the NCC’s versatile space, and Lift-the-Lid shows a 3D CGI representation of the venue’s building configurations with cut-aways to show the floorplans, rooms and layouts within, so buyers can explore and discover the most suitable room configuration for their needs. A traditional-looking capacity chart has all the capacities and sizes but also the added advantage of being linked to the floorplans so that searches can be made dynamically and interactively. This powerful flexibility enables buyers to spend more time at their convenience arriving at an ideal choice of rooms and room layouts and, with a click of a button, they can make an enquiry directly with the NCC. The NCC’s vFloorplan takes user interactivity further. A more flexible alternative to traditional 360s that usually can only show one room layout style, enables the NCC’s headline spaces – the Britannia and Imperial Suites – to enjoy a more immersive experience by showing all room layout options within one image of the room, in both high and lower detail to accommodate faster and slower internet connections.